Note: This is an excellent indication of overall functional strength. Can anyone total over 800lb.? Work through each skill at a comfortable pace, in any order you choose. This is not a timed evolution. Try to set a 5lb. record in each lift. The last time the “CrossFit Amundson Total” was calculated in our gym was August 21, 2014. Following Monday’s epic battle at CrossFit Amundson, Efrain, Carey and Tobias stand shoulder to shoulder reviewing the collected data from their effort. 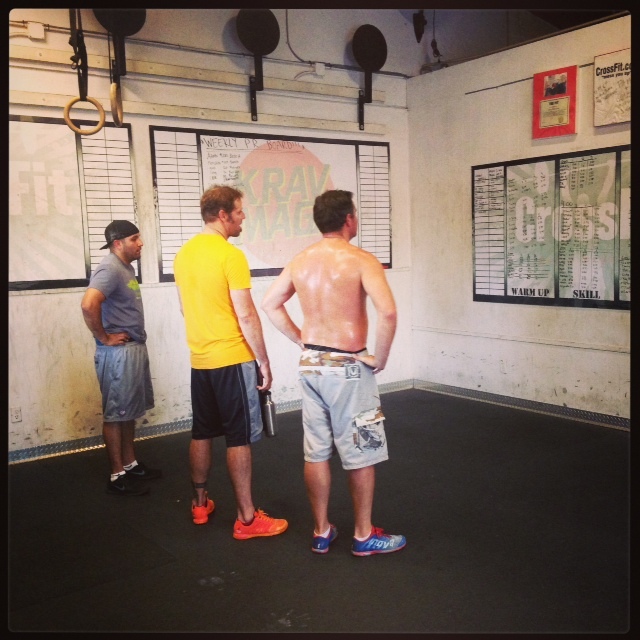 The Whiteboard at CrossFit Amundson is a daily testimonial to the heart and determination of our Athletes. It also teaches the wisdom of showing up, doing our best, and then letting go, knowing that every night the Whiteboard is erased in preparation for a new day. Congratulations to all our Athletes on an incredible week of “dedication to practice” both inside and outside the gym. From the challenging metabolic workouts, to the EPIC Stand Up Paddle, to the brutal Endurance WOD at Blue Ball Park, to the stillness of the Yoga classes, the heart of our Athletes shined brightly every day. Greg Amundson, a former US Army Captain and Drug Enforcement Administration (DEA) Special Agent, will be teaching a free Warrior Body Zen Mind Yoga class every Friday from 10:00 AM to 11:00 AM for Santa Cruz County Military Veterans. Military Veterans of all branches of the Armed Forces are welcome to attend this free class as guests of CrossFit Amundson.